Emergency medicine is one of the fastest growing specialties in Malaysia and also in the South East Asian region. To ensure that the growth of the specialty is sustainable, the specialty should produce good researches using local South East Asian data. Having such a platform for these researches will encourage more publications in clinical and administrative emergency medicine. These includes traumatology, emergency and critical care ultrasound, toxicology, pre-hospital care, paediatric emergency medicine, geriatric emergency medicine, palliative care, hyperbaric medicine, disaster medicine, simulation medicine and administration. 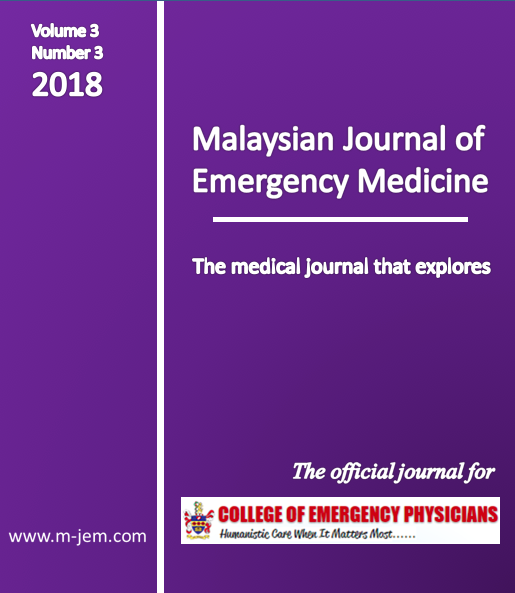 The Malaysian Journal of Emergency Medicine or MJEM is created to provide such a platform for South East Asian and also other international emergency medical services alike. It is an open access on line peer reviewed journal. This journal features original articles, case reports, short communications, commentaries and letters to editor. Manuscripts can be submitted on line using the methods described in the submission section. EMAS Meeting 2018 abstract submission has been closed. Retrospective review of feedback from medical students following the integration of disaster moulage as a part of personal and professional development camp (PPD Camp) game activities. What is the cause of this patient odynophagia?